Another day just like the others. Over night low was 40F and high this afternoon was 60F. Again the wind was negligable and it was bright and sunny all day long. We are starting to get up earlier. Joy was ready to go at 8:00AM, which is really early for her. Cathy was even up early. We have to do the same tomorrow, La Mesa RV’s free breakfast is biscuits and gravey. Just after lunch the bread man showed up and returned the brown sugar and beer in the form of a loaf of bread. 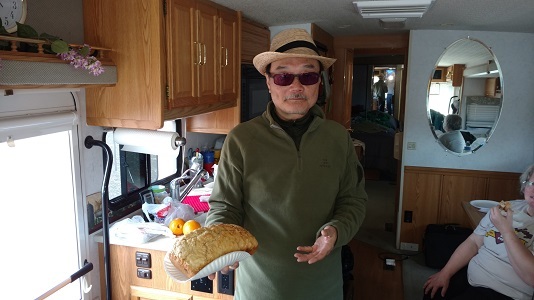 This was Alan’s first baking with his motor home oven. He bought a pizza stone yesterday to distribute and even out the heat. It was a little too large to use the way he wanted. Cathy tried the bread warm. I had just finished a large summer sausage on rye bread so haven’t tried it yet. Worked on installing a new solar charge controller. Got it mechanically and electrically installed. Will finish tomorrow. Some thing strange with the cables going to the batteries. Needed gas for the Honda generator and ice cream, so we went into Quartzsite. We stopped at the building on the east end of Mainstreet West vendor area where they are selling cast items and metal work signs and lawn ornaments. Will probably go back. In the parking lot, a man saw my Menard’s sweatshirt and asked where I was from. He was a retired teacher from South Dakota. His wife was also a retired teacher. They stay in a park here in Quartzsite. They bought a fifth wheel trailer in Rapid City that had been brought in to sell in Williston. It has extra insulation and an office. Went to Dollar General and bought sausages, buns and beans for dinner. Also got ice cream. They were out of olives and pickles so went to Family Dollar. The stores are turning over their inventory pretty fast. Got back to motor home just before dark. Walked Joy and talked to Jerry and Diane. They told me about biscuits and gravey at La Mesa RV and about a place that does glass repair on RVs. They had a fogged window done. We need a windshield and have one fogged window on the driver’s side corner. The Presidential Debate just came on Fox and I will watch that tonight for entertainment.